A manager’s life is not an easy one, he has a lot of things to do. He has to set objectives, organize people to accomplish the task, motivates people, measure the target, develop the people and to manage his field staff. To get things done he needs face-to-face meeting but with so much responsibility it becomes difficult for a manager to manage his team who do not work in the office but on the field. To manage his team and to know whether they are arriving for work on time, meeting the client and receiving the payment for the same; he had to keep a check on it. But, sometimes it becomes tricky for a manager to get updates of his employee and generate a daily sales report. How can a manager track his on-field staff? A manager’s duty is just not to keep a check on his employees but a way beyond. His busy schedule, meetings, and workload involve so much of his time that to track on-field staff he can’t just rely on the words of his on-field staff. A manager still can track his on-field employee without worrying of the data authenticity. How?? 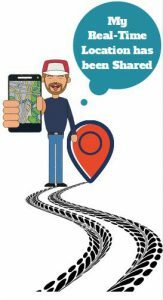 With TeamSpoor android based application, a manager can easily track his employee and can keep a check on his staff’s location through GPS tracking and many more things. A GPS tracking unit is a device that uses the Global Positioning System to track any person to determine the location of a vehicle, person or any other moving object through a mobile phone. And If a manager uses this in tracking his employees, it can give accurate and exact data with the TeamSpoor application. TeamSpoor is an application which can be downloaded on the android phone. If you are an owner of Service/ Repair Industry then the application download is a must as it lets you track your on-field staff easily. Your on-field staff i.e technician when go out to repair or install your equipment such as Air Conditioner, Refrigerator, Computer, Electrical lightening and any such items which needed repairing and assistance of your staff. The application can also be used to schedule work orders for almost any service business including electricians, equipment repair technicians, installation departments, HVAC companies, computer repairmen, manufacturers, and almost any type of repair or service industry. A business owner of a Repair Industry when has to manage his on-field team becomes difficult for him to keep an eye on them as his staff keeps on going place to place. The TeamSpoor application helps a business owner in locating the technician and also knows his daily sales report. The above data shows how an on-field executives’ daily activity is getting recorded in the application and makes the manager easily know what his on-field executive is doing by sitting far away from him. As the technician sends the DSR report (Daily Sales Report) to his manager by which it makes simpler for a manager to easily know every single activity. What Effects Application has on Your Service/Repair Industry? The application can help your industry and can make you grow your resources and profits by keeping a check on your staff. The technician when went out to the client for repairing and installing the electronic or any other item then his all details are all recorded on the mobile application concerning only related within the job. From meeting his client, doing the repair and installation work to receiving the payment for the same. The details of service contracts are recorded on the application and lets managers to easily know the clients’ details. Service contracts are agreements for specific acts, such as providing service to items such as repair and installation of AC, refrigerator and more. They’re used predominantly by contractors, freelancers, and consultants and, generally involve client who is taking the service to pay the technician or repairman to perform a certain act. The application also makes easy for you to log, organize, and evaluate phone calls, service calls, follow-up contacts, and other customer related information easily. Making your work easier by information being available one click away. To maintain records of the installation done of equipment or whole goods is made simpler with the application. It helps you see all the work performed by the technician and also helps you in making a list of the installation done of the equipment. The TeamSpoor application is a powerful combination of the task and job costing that allows the manager to organize and track labor, material, and billing processes within a construction, manufacturing, or other type of job or project. Use this beneficial application which can help your business gain revenue and achieve success.